A crowd of about 200 supporters clapped and chanted the words “Which side are you on?” and “Too much, magic bus,” to draw attention to the lecturers’ demands in their upcoming contract renegotiation. 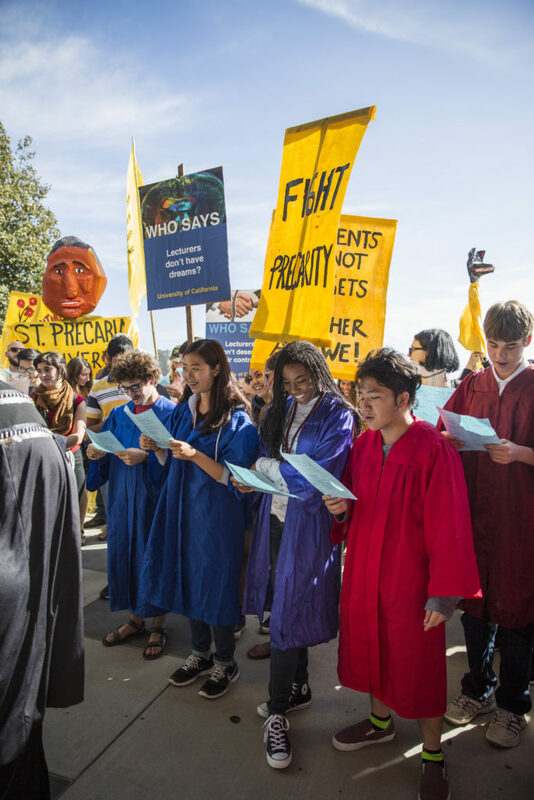 The demonstration began at the Quarry Plaza on Oct. 22 where supporters dressed for show in graduation gowns, sang, and held posters and puppets. Demonstration leader and lecturer Roxi Power believes theater is an effective art for engaging students in activism. 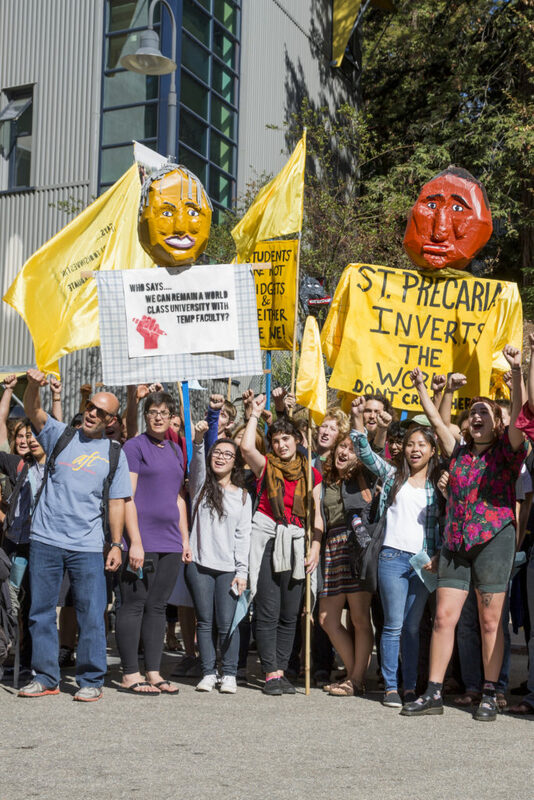 Since the University Council-American Federation of Teachers (UC-AFT) contract is set to expire on Oct. 31, UC Santa Cruz lecturers demanded reasonable class sizes, job security and stability with a fair salary and benefits. Unlike professors, lecturers and adjuncts teach the majority of core and lower-division undergraduate classes. They have less job security and pay. They also don’t receive automatic contract renewals. 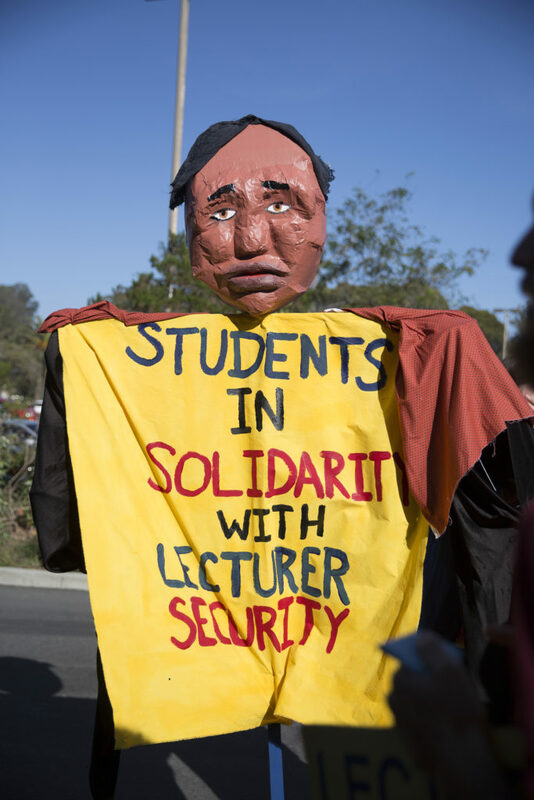 Lecturers are non-tenure faculty and are known as adjunct or contingent faculty. In addition to a lack of job security, contingent faculty have little to no governance in curriculum planning or access to faculty meetings. UC Office of the President spokesperson Kate Moser said the university’s negotiations with UC-AFT are ongoing, and progress is being made at the bargaining table. Supporters took their passion and enthusiasm from Quarry Plaza to the UCSC Staff Human Resources building by bus to gather outside of the Employee and Labor Relations Office. With a microphone in hand, Power lead the crowd in song and discussion on the unfair treatment of contingent faculty. Second-year Alice Malmberg, an advocate for lecturers’ rights, attended UCSC’s previous lecturers’ demonstration at the base of campus last spring quarter. Several members of the United Auto Workers (UAW) Local 2865 attended the demonstration as well. The UAW is a union that oversees the working rights of academic student employees like tutors, teaching assistants and graduate student instructors. Aaron Wistar, a member of UAW Local 2865 and teaching assistant in the community studies department, said he’s a supporter of lecturers’ rights because he faces many of the same challenges as a teaching assistant. The large turnout of students, lecturers and faculty supporters at the demonstration left Roxi Power optimistic about the growing transparency of lecturers’ working conditions. The crowd cheered when UCSC Director of Academic Employee Relations Susan Fellows stepped out of her office during the demonstration in solidarity. When asked if he thought the lecturers demonstration had been effective, second-year Collin Couch said that although most of the staff stayed inside, he hoped their message was clear to the few who did step out.